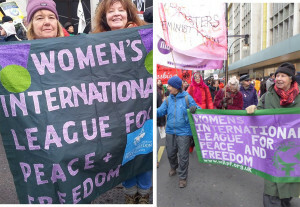 We have a local WILPF planning group and meet on a regular basis. We respond to current events and often work with other like-minded groups by jointly hosting speakers, running stalls, supporting vigils or demonstrations. We mark particular days, such as International Women’s Day, Hiroshima Day, the annual Peace Camp and the local Burston Rally – which commemorates the longest (school) strike in history. We share information and receive reports including those from WILPF UK and WILPF International. We support and work with the local University of East Anglia both by contributing to modules and by helping to establish and collaborating with the WILPF Student Society. All local women are welcomed at our bi-monthly meetings held at The Friends Meeting House, Upper Goat Lane, Norwich, NR2 1EW, starting at 10 am. 2017 dates are: Saturday 28 January, Saturday 4 March, Saturday 6 May and Saturday July 1 . Afterwards (apart from January), there’s an opportunity to join the Norwich Peace Forum at 12 noon for a silent vigil outside St Peter Mancroft Church. During 2017 the Norwich & Norfolk Branch will join with other local groups across the city and the county. Confirmed activities include “Breaking the Silence” (Wed 8th March 10.30 – 12.30, as part of International Women’s Day) which this year focuses on eliminating all forms of violence against women and girls worldwide. On Saturday 15th July we will join with others at the popular Peace Fair in the Forum in Norwich, and on Sunday 3rd September we will once again be rallying at Burston near Diss.